Dr. Fawzi holds a first class BSc (Hons) Biology with Environmental Sciences, following which he secured the competitive Tertiary Education Commission postgraduate national scholarship to read for his MPhil/PhD in collaboration between University of Mauritius and TWAS-accredited H.E.J Research Institute of Chemistry and Dr. Panjwani Center for Molecular Medicines and Drug Research, Karachi, Pakistan. 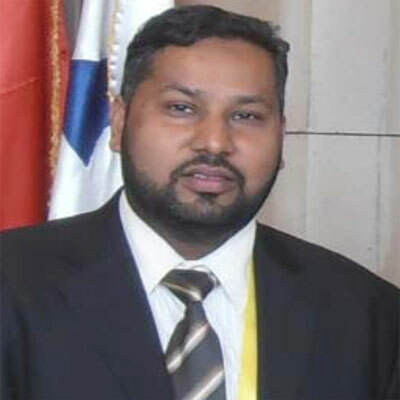 He is the alternate director of AAMPS and has been nominated as the TWAS-ROSSA young Affiliate (2012-2016), member of the Global Young Academy (2013-2016), recipient of the young promising scientist from Mauritius to attend the TWAS/BVA.NXT Biovision 2012 Egypt and the ASM Young Educator grant to Boston. USA. Fawzi has published more than 69 papers in ISSN/impact factor journals, edited 18 book chapters and 4 academic books. He has also secured more than 25 fellowships/travel grants to attend international seminars, teaching tool workshops/conferences; namely the International Brain Research Organization sponsorship to attend neurosciences schools in Africa (University of Cape-Town- South Africa, Fayoum University- Egypt, Rhodes University- South Africa, and Reunion University- France) and the SAN-Bio (Nepad) workshop- South Africa, Global Knowledge Initiative, Uganda. Fawzi is presently the PI and co-PI of 5 research grants/consortium regionally and internationally. He has organized/instructed 8 international/national workshops/training. Presently, Fawzi is the scientific editor and reviewer of > 15 peer-reviewed international scientific journals. He has also been nominated in several national committees: Currently member of the National Pharmacovigilance Committee, Ministry of Health & Quality of Life (MOHQL), Mauritius, part of National Research Foresight Exercise (expert working group: field public health/Biomedical Sciences), nominated to attend the African federation of public health associations (AFPHA)- by the WHO and MOHQL- and have been a technical member for the innovators award IV Out of Home Food by the National Productivity and Competitiveness Council, Mauritius. Fawzi is active researcher and the principal supervisor of > 45 undergraduate, 5 MSc and 5 on-going MPhil/PhD projects working on medicinal properties of functional foods/medicinal herbs of Mauritius. Publishing your research in Asian Journal of Clinical Nutrition is simple and efficient. You will be guided through the submission process step by step. Before submission of your manuscript, it is strongly recommended to read Guide for Authors to minimize the chances of manuscript rejection.